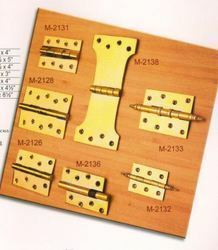 Brass Hinges offered by us are manufactured by fine quality brass to offer high consistency. We offer these products which are manufactured by implementing latest technology to offer very trendy look with high functionality. These products are widely appreciated for its latest design and sturdy construction. We offer these Brass Hinges at most economic rate. We are specialized in supplying superior quality Brass Hinges - ASI 7150. Rod Hinge with MS pin. Description and Size : 6", 8", 10", 12" 18" and 24"
Our Hinges are widely appreciated by our clients for the high tensile strength and durability. We manufacture our Hinges using high quality that abide by industry standard and are quality tested on various parameters. Moreover, to cater our client’s diverse requirements, we make our Hinges available in different specifications.